Comhghairdeas lena gcailíní a bhuaigh Corn INTO inné i bPáirc an Chrócaigh! D'imir na cailíní go hiontach agus bhíomar an-sásta an corn a thógáil ar ais go GSUE! GSUE Abú! Comhghairdeas don fhoireann shinsearach a bhuaigh i gcoinne Scoil Bhride roimh an Cháisc agus i gcoinne Fionnradharc an tseachtain seo chaite sa chéad bhabhta den chomórtas Cumann na mBunscol Áth Cliath. Tá cluiche amháin fágtha ag na cailíní sa ghrúpa. Go n-eirí libh chailíní! 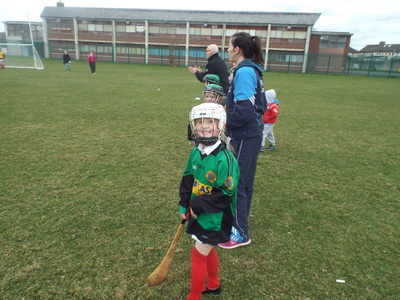 Bhí cuireadh tugtha do Ghaelscoil Uí Earcáin páirt a ghlacadh i mblitz a d'eagraigh Scoil Náisiúnta Chill Coscain i bpáirc Naomh Maighréide. Bhí trí fhoireann sa blitz, muid féin, Scoil Náisiúnta Chill Coscain agus D7 Educate Together. D'imríomar i gcoinne an dá scoil eile agus bhí dhá bua maith againn. Bhí na cluichí an-mhaith, an-spóirtiúil agus an-sciliúil agus bhí áthas an domhain ar na buachaillí an bua a bheith acu. Ansin bhí lón againn, agus chuir Scoil Chill Coscain agus Cumann Naomh Maighréide BBQ ar fáil do na páistí, féach thíos agus feicfidh sibh iad ag baint taitneamh as burgaire! Tar éis lóin, bhris na páistí ó na trí scoil suas isteach i ceithre fhoireann Contae: Cill Chainnigh, Tiobrad Árainn, An Chláir agus Corcaigh. Thug sé seo deis iontach do na buachaillí imirt le páistí nár imir siad riamh cheanna leo. 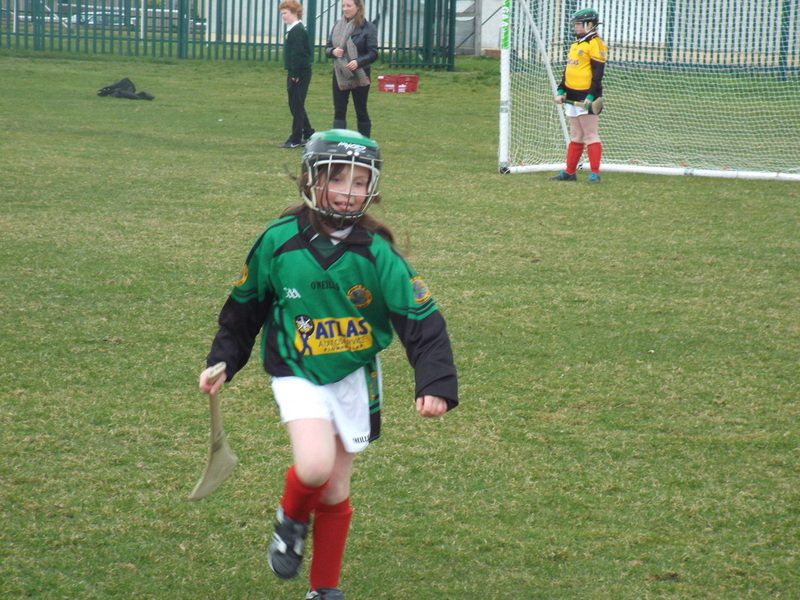 Bhí dhá cluiche leath ceannais agus bhí an bua ag Cill Chainnigh agus An Chláir. 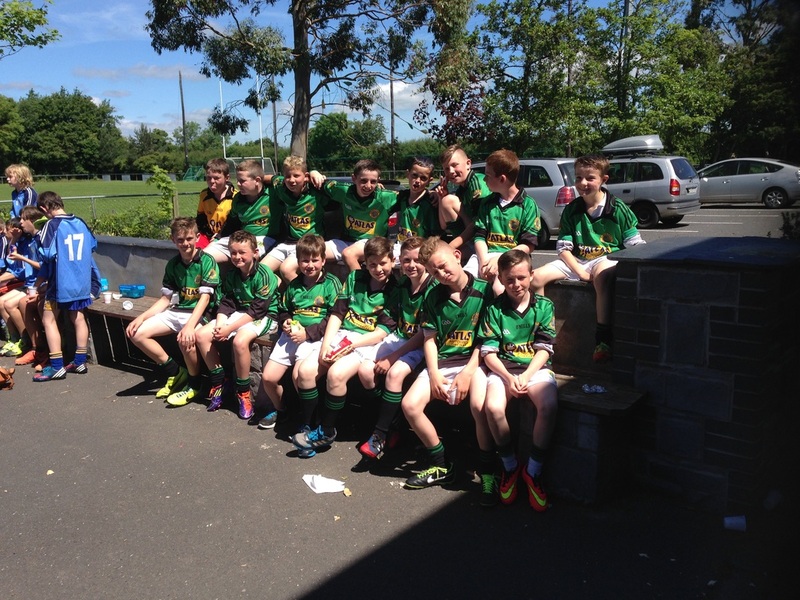 D'imir Corcaigh i gcoinne Tiobrad Árainn san "All Ireland Shield", agus bhí an bua ag Corcaigh. D'imir Cill Chainnigh i gcoinne An Chláir, agus don dara bliain as a céile, bhí an bua ag an Chláir san "All Ireland Final"! Ag deireadh an lae, fuair na páistí ar fad bonn, chomh maith le cúpla "goodies" agus iad ag dul abhaile. Ba mhaith linn buíochas a ghabháil le Phil ó Scoil Chill Coscain, Eoin agus Niamh ó D7 ET, agus go háirithe leis na páistí ar fad a ghlac páirt. Ar deireadh, ba mhaith liom buíochas a ghabháil le na páistí ar fad, buachaillí agus cailíní, a tháinig ag traenáil agus ag imirt cluichí i rith na bliana. Ba mhaith liom buíochas a ghabháil chomh maith le na tuismitheoirí agus na múinteoirí a thug cabhair i rith na bliana, go háirithe Natasha, Múinteoir Alison agus Múinteoir Ciara, chomh maith le na múinteoirí eile a bhí tuiscineach, fadhnach agus solúbtha i rith na bliana. Bhí bliain iontach againn leis an iománaíocht agus le cúnamh Dé beidh bliain níos fearr againn an bhliain seo chugainn. Tá súil agam gur bhain na páistí ard-taitneamh as mar bhain mise an-taitneamh as a bheith á dtraenáil. Gaelscoil Uí Earcáin abú!! 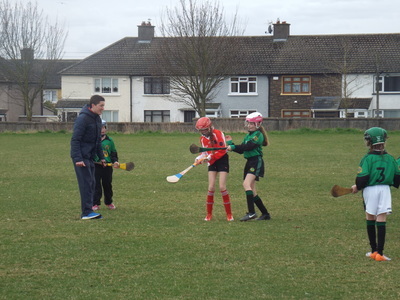 Gaelscoil Uí Earcáin were invited to participate in a blitz organised by Kilcoscan NS in the grounds of St. Margaret's GAA club. There were three teams involved in the blitz: Ourselves, Kilcoscan and D7 Educate Together. 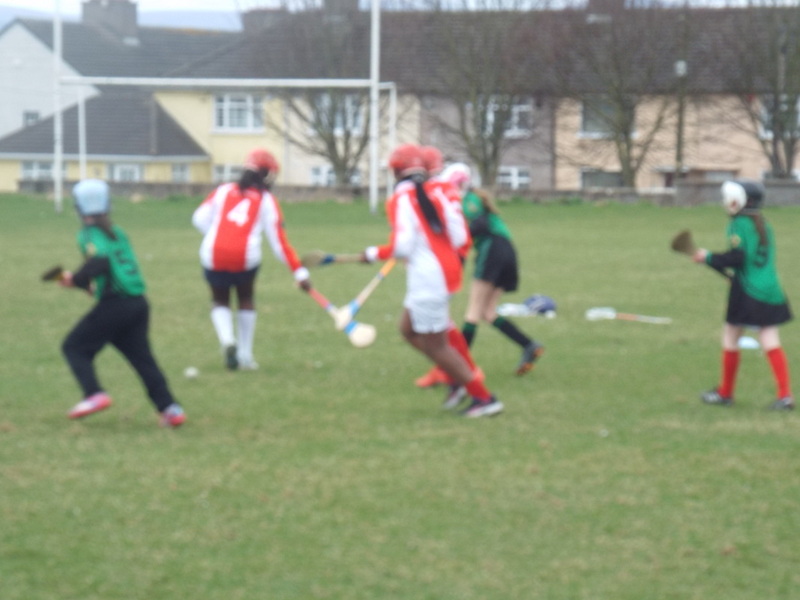 We played against both of the other schools, and had two good, hard fought victories. 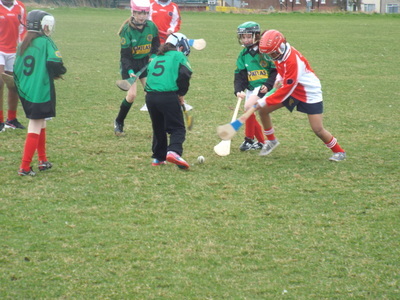 There was a high level of skill and athleticism on show, and the games were played in a very good, sporting spirit. The boys were delighted to get the two wins. 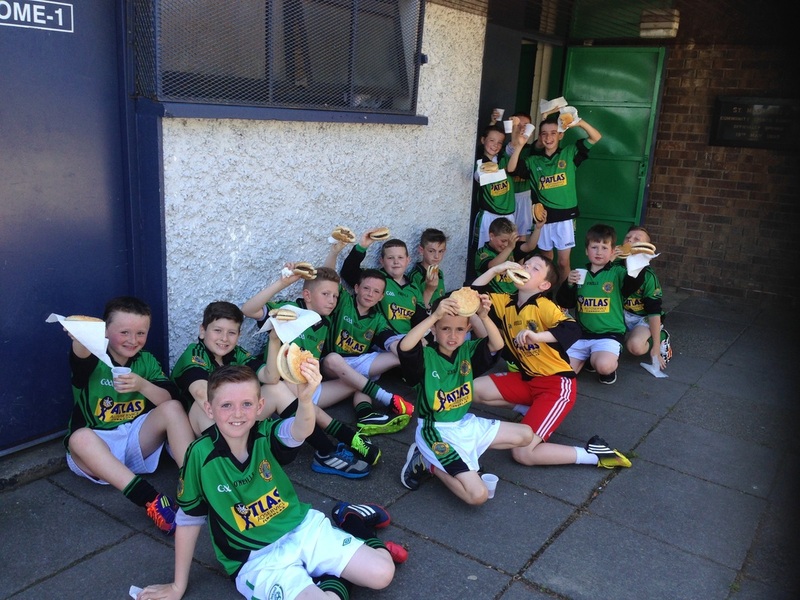 After the games, we paused for lunch, and Kilcoscan NS, along with St. Margaret's GAA club, were kind enough to put a BBQ on for the kids, see the boys enjoying their burgers below! After lunch, the children from all three schools were mixed up to create 4 county teams: Kilkenny, Cork, Tipperary, and Clare. This gave the kids a great opportunity to play with kids they had never met before, and the teamwork and good nature between the kids was fantastic to see. There were two semi finals, where Kilkenny and Clare emerged victorious. Cork and Tipperary played an All Ireland Shield Final, where Cork were victorious. Meanwhile, in the All Ireland Final, for the second year in a row Clare were crowned champions! At the end of the day all the kids got a medal, as well as a few goodies to bring home. We would like to thank Phil from Kilcoscan NS, Eoin and Niamh from D7 ET, and especially, all the children for making it such a fantastic day out. Finally, I would like to thank all the children, both boys and girls, who who came training and to matches during the year. I would also like to thank the parents and the teachers who helped out during the year, especially Natasha, Múinteoir Alison and Múinteoir Ciara, as well as all the other teachers who have been patient, flexible and understanding all year. We had a great year of hurling, and hopefully next year we will have an even better year. I hope the children enjoyed playing as much as I enjoyed coaching them. GSUE abú!! Bhí cluiche ag na buachaillí Dé Máirt, 25ú Márta, i gcoinne Gaelscoil Bharra. Cluiche íontach spóirtiúil a bhí ann, agus bhí ard-chaghdán le feiceáil. Bhí an ghaoth ag Gaelscoil Bharra sa chéad leath agus bhaineadar úsáid maith as seo chun cúpla cúl a fháil. Bhí siad chun cinn ag leath ama, 3-2 in aghaidh 2 phointe. 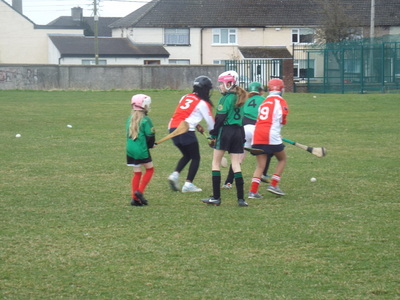 Sa dara leath, d'úsáid Gaelscoil Uí Earcáin an ghaoth chun cúpla scór tábhachtach a fháil, ach faraor níor éirigh linn an bhearna a thrasnú agus chailleamar 4-2 in aghaidh 1-5. Bhí an caghdán an-ard ag an dá fhoireann agus bhí Múinteoir Tighearnán an-bhródúil as na himreoirí ar fad a chuaigh ar an bpáirc. Beidh muid ar ais ag traeneáil Dé Máirt seo chugainn sula dtugann muid aghaidh ar Scoil Chiaráin Déardaoin seo chugainn, an 3ú lá d'Aibreán. The boys team had a match on Tuesday, 25th March against Gaelscoil Bharra. It was a great game played in the right spirits and there was a very high standard on show. Gaelscoil Bharra had the wind at the backs in the first half and used this well to score a few goals. They were ahead 3-2 to 0-2 at half time. In the 2nd half, we had the wind and we got some important scores, but unfortunately we couldn't bridge the gap, and we lost 4-2 to 1-5. 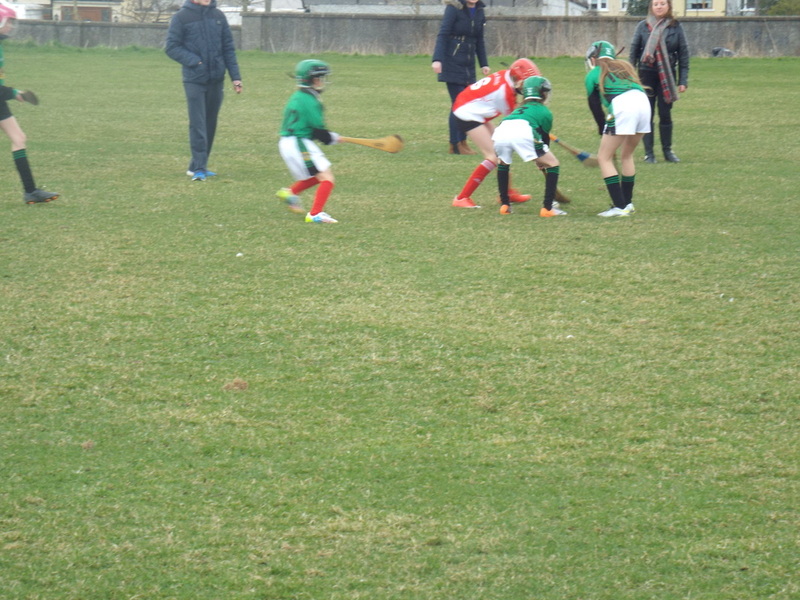 The standard was very high from both teams and múinteoir Tighearnán was very proud of all the players who took to the field. We will be back training on Tuesday as we look ahead to the next match against Scoil Chiaráin on Thursday, the 3rd of April. Cluiche Camógaíochta: GSUE v Audoens. Bhí cluiche Camógaíochta ag Gaelscoil Uí Earcáin i gcoinne Audoens ar an gCéadaoin, 19ú Márta. Ba í seo an chéad cluiche Camógaíochta riamh ag an scoil. D'imir na cailíní thar cinn agus bhí siad ar bharr sa chéad leath ach níor éirigh leo cúl a fháil, agus bhí an dá fhoireann ar chomh scór ag leath ama, 0-0 go dtí 0-0. Sa dara leath, bhí na cailíní ag imirt i gcoinne na gaoithe, agus faraor, d'éirigh le Audoens cúpla cúl a fháil chun an cluiche a bhuachaint. An scór deirigh: GSUE: 0-0, Audoens: 3-0. Bhí múinteoir Tighearnán agus Múinteoir Alison an-bhródúil as na cailíní ar fad, mar gur lean siad orthu agus rinneadar a ndícheall don cluiche ar fad. Bhí na cailíní ar ais ag traeneáil Dé Máirt seo caite agus iad ag súil go mór leis an gcéad cluiche eile, a bheidh ar siúl i bpáirc an Radharc Aoibhinn i gcoinne Scoil Mhuire ar an gCéadaoin seo chugainn, 2ú Aibreán. 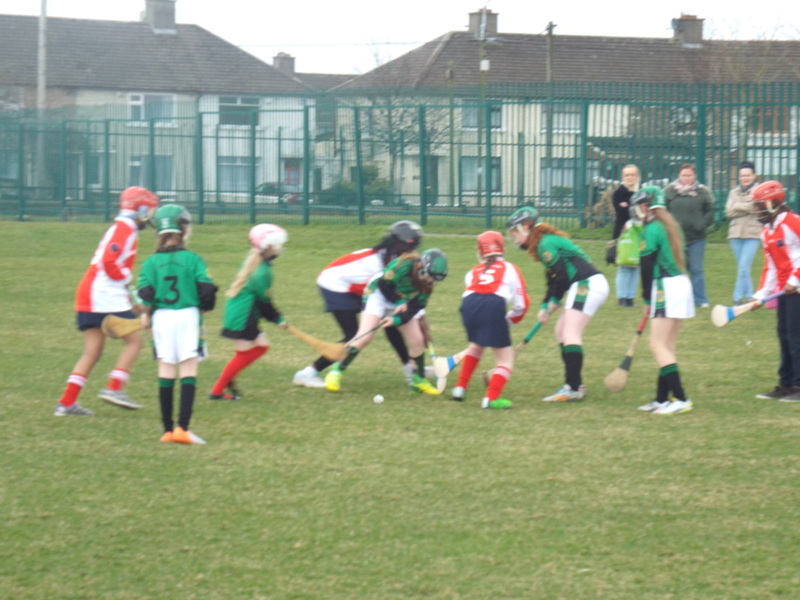 Gaelscoil Uí Earcáin had a camogie match against Audoens on Wednesday, 19th March. This was the first camogie match the school ever participated in. The girls played brilliantly and were on top in the first half, but unfortunately they didn't manage to get a score on the board, and at half time the teams were level, 0-0 to 0-0. In the 2nd half, we were against the breeze and unfortunately, Audoens used this breeze to their advantage and managed to score a couple of goals to win the match. The final score: GSUE: 0-0, Audoens: 3-0. Múinteoir Tighearnán and Múinteoir Alison were both extremely proud of the girls, because they never gave up and tried their hearts out until the very end. 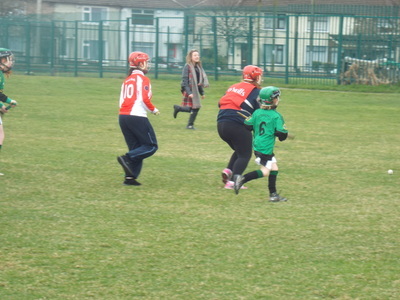 The girls were back training last Tuesday and they are all looking forward to the next match, which will be against St. Mary's of Fairview in Fairview Park on Wednesday, 2nd April. Tá iománaíocht le tosú ar an Mháirt, 04 Feabhra 2014 tar éis scoile do bhuachaillí agus cailíní ó Rang a dó agus Rang a 3. Ní bheidh sé ag dul ar aghaidh má bhíonn sé ag cur báistí nó má bhíonn an pháirc ró-fhliuch. Seolfar téacs maidin Dé Máirt má bhíonn an traeineáil curtha ar ceal. Beidh blitz ar siúil ar an 03 Márta i gCumann Setanta ar Bhóthar Bhaile Muna, agus beidh muid fíor bhuíoch d'aon tacaíocht. Thosaigh an scoil ag smaoineamh ar fhoireann iománaíochta a eagrú roimh na Nollag, nuair a d’eagraigh Natasha agus tuismitheoirí eile oíche i gCumann Oileán na hÉireann i bhFionnghlas, chun airgead a bhailiú le haghaidh trealaimh iománaíochta. Bhí an oíche seo an-tairbhreach agus bailíodh go leor airgid. D’úsáid an scoil an t-airgead seo chun fiche cloigead iománaíochta a cheannach, le cúnamh ó Chumann na mBunscoil, a thug camáin dúinn chomh maith. Chabhraigh coiste na dtuistí go mór linn chomh maith nuair a thug siad a thuilleadh airgid don scoil, a d’úsáideamar chun sliotair, agus trealamh iománaíochta eile a cheannach. Mar sin bhíomar réidh le tosú. Cuireadh tús le iománaíocht i nGaelscoil Uí Earcáin i Mí Feabhra 2013 do rang 2 agus rang 3. Bhí traeneáil ar siúl ar an gCéadaoin tar éis am scoile le múinteoir Tighearnán agus Natasha. Bhí alán suime san iománaíocht agus tháinig níos mó ná fiche páiste gach seachtain! Bhí an chéad chluiche againn in aghaidh Gaelscoil Choilmcille, agus Scoil Móibhí ar an Luan, 4ú Márta, agus cluiche eile in aghaidh na scoileanna céanna ar an Máirt, 5ú Márta. Bhí comhscór againn i gcluiche amháin agus d’imir na páistí go híontach ar fad an dá lá. Bhí cluiche eile againn i gcoinne Gaelsoil Bhaile Munna ar an Máirt agus arís d’imir na páistí ar fad go hiontach. Bhí mí-ádh ceart linn an lá seo agus chailleamar a 2-1. Beidh iománaíocht ar siúl arís i 2014 agus an uair seo beidh fáilte roimh páistí ó na hardranganna chomh maith. Beidh cluichí eagraithe i gcomhair páistí rang 2 agus 3, agus páistí sna hardranganna chomh maith. Más mian le aon tuismitheoir nó cara leis an scoil cúnamh a thabhairt do múinteoir Tighearnán agus do Natasha, beidh fáilte ollmhór rompu. Ar ndóigh, beidh an scoil agus na páistí fíor-bhuíoch d’aon tacaíocht a fhaighimidnuair atá cluiche á imirt againn. Gaelscoil Uí Earcáin Abú!! The idea for a hurling team in the school started before Christmas, when Natasha and her hard working friends organised a fundraising night in Erin’s Isle Gaa Club. This was a very successful night, and with the funds raised, the school bought 20 hurling helmets, with help from Cumann na mBunscoil, who also supplied us with hurlies. 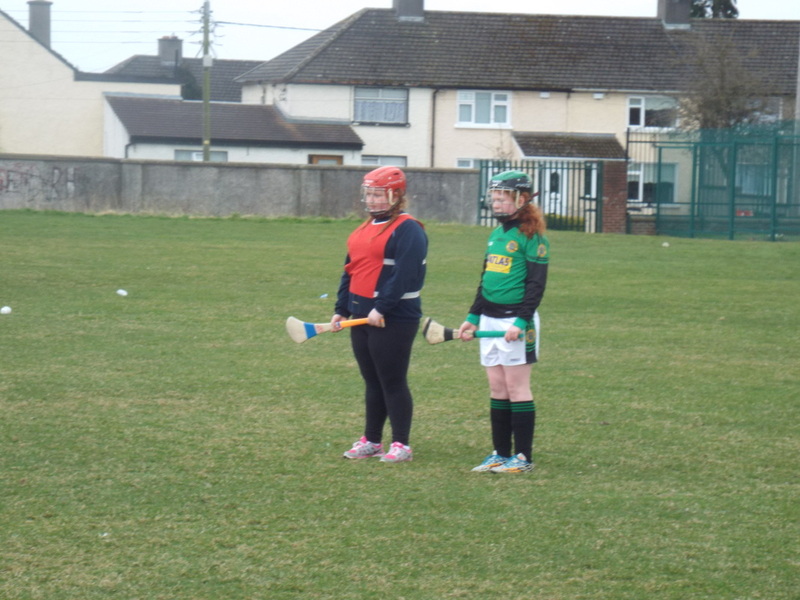 Coiste na dTuistí also helped with a generous donation, which was used to purchase sliothars and other training equipment. We were then ready to begin training. We started training in February 2013 with children from 2nd and 3rd class participating. 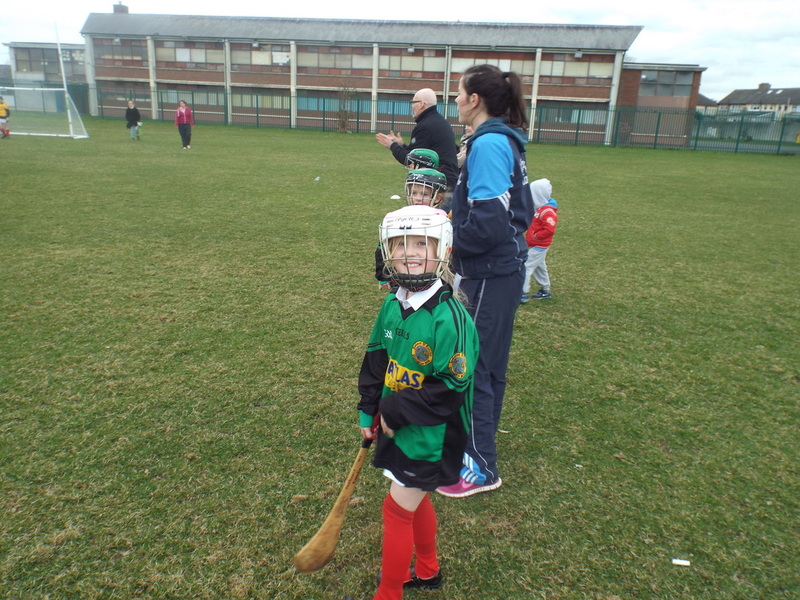 Training took place every Wednesday, with Múinteoir Tighearnán and Natasha, with over 20 children taking part in each training. 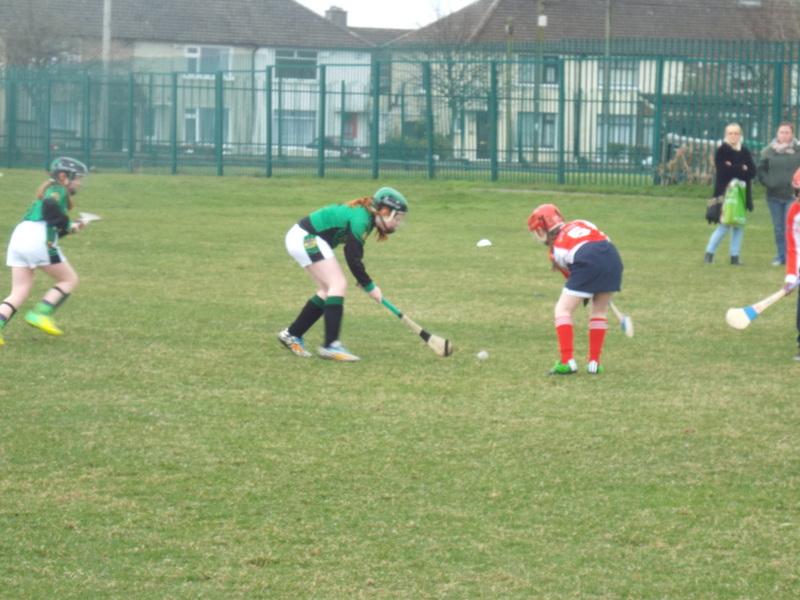 We had our first match on the 4th of March, and we played against Gaelscoil Choilmcille and Scoil Móibhí, and we also played against the same schools on Tuesday the 5th of March. We drew one of the matches, and the children all played excellently in every match. 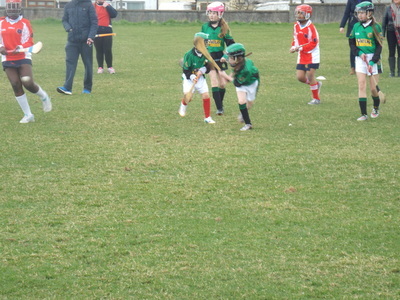 We had another match against Gaelscoil Bhaile Munna on Tuesday the 12th March. The children played out of their skin again, and we were very unlucky to lose 2-1. Hurling will be taking place again after the Easter break, and this time children from 4th, 5th and 6th will be welcome to attend. 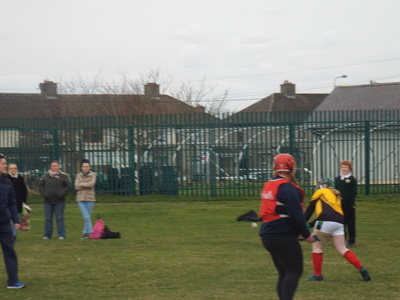 Matches will be organised against other schools, for 2nd and 3rd class, and also for the higher classes. If any parent or friend of the school would like to help Múinteoir Tighearnán and Natasha, they will be more than welcome, and of course, the school and especially the children will appreciate any support they can get at matches. Gaelscoil Uí Earcáin Abú! !